DARPA’s Short-range Wide-field-of-view Extremely agile Electronically steered Photonic EmitteR (SWEEPER) program has successfully integrated breakthrough non-mechanical optical scanning technology onto a microchip. Freed from the traditional mechanical architecture of gimbaled mounts, lenses and servos, SWEEPER technology has demonstrated that it can sweep a laser back and forth more than 100,000 times per second, 10,000 times faster than current state-of-the-art mechanical systems. It can also steer a laser precisely across a 51-degree arc, the widest field of view ever achieved by a chip-scale optical scanning system. This wide-angle demonstration of optical phased array technology could lead to greatly enhanced capabilities for numerous military and commercial technologies, including autonomous vehicles, robotics, sensors and high-data-rate communications. 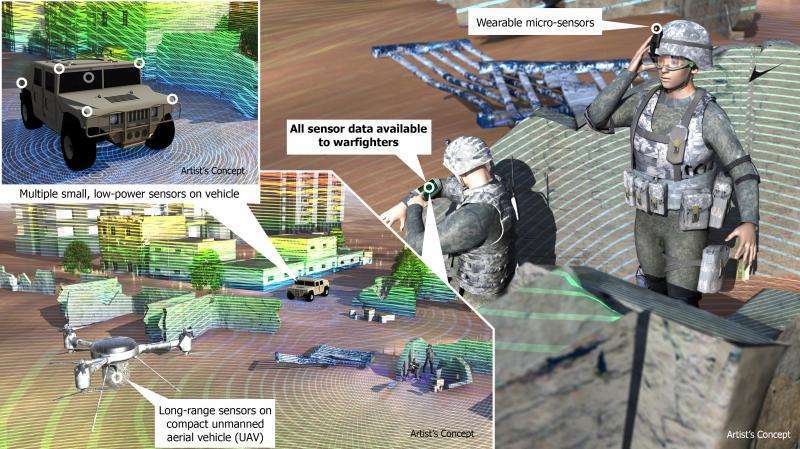 Many essential military capabilities—including autonomous navigation, chemical-biological sensing, precision targeting and communications—increasingly rely upon laser-scanning technologies such as LIDAR (think radar that uses light instead of radio waves). These technologies provide amazing high-resolution information at long ranges but have a common Achilles heel: They require mechanical assemblies to sweep the laser back and forth. These large, slow opto-mechanical systems are both temperature- and impact-sensitive and often cost tens of thousands of dollars each—all factors that limit widespread adoption of current technologies for military and commercial use. In an advance that could upend this status quo, DARPA's Short-range Wide-field-of-view Extremely agile Electronically steered Photonic EmitteR (SWEEPER) program has successfully integrated breakthrough non-mechanical optical scanning technology onto a microchip. Freed from the traditional architecture of gimbaled mounts, lenses and servos, SWEEPER technology has demonstrated that it can sweep a laser back and forth more than 100,000 times per second, 10,000 times faster than current state-of-the-art mechanical systems. It can also steer a laser precisely across a 51-degree arc, the widest field of view ever achieved by a chip-scale optical scanning system. These accomplishments could open the door to a new class of miniaturized, extremely low-cost, robust laser-scanning technologies for LIDAR and other uses. SWEEPER technology is to be developed further through DARPA's Electronic-Photonic Heterogeneous Integration (E-PHI) program, which has already successfully integrated billions of light-emitting dots on silicon to create an efficient silicon-based laser. "By finding a way to steer lasers without mechanical means, we've been able to transform what currently is the largest and most expensive part of laser-scanning systems into something that could be inexpensive, ubiquitous, robust and fabricated using the same manufacturing technology as silicon microchips," said Josh Conway, DARPA program manager. "This wide-angle demonstration of optical phased array technology could lead to greatly enhanced capabilities for numerous military and commercial technologies, including autonomous vehicles, robotics, sensors and high-data-rate communications." Phased arrays—engineered surfaces that control the direction of selected electromagnetic signals by varying the phase across many small antennas—have revolutionized radio-frequency (RF) technology by allowing for multiple beams, rapid scanning speeds and the ability to shape the arrays to curved surfaces. DARPA pioneered radar phased array technologies in the 1960s and has repeatedly played a key role in advancing them in the decades since. Transitioning phased-array techniques from radio frequencies to optical frequencies has proven exceptionally difficult, however, because optical wavelengths are thousands of times smaller than those used in radar. This means that the array elements must be placed within only a few microns of each other and that manufacturing or environmental perturbations as small as 100 nanometers can hurt performance or even sideline the whole array. The SWEEPER technology sidesteps these problems by using a solid-state approach built on modern semiconductor manufacturing processes. Ideal for LIDAR guided autonomous vehicles; to down scale the huge rotating prisms on the roof of the google cars. -Even if multiple units are needed for 360 degree coverage.